You know the drill: select an image somewhere on your hard drive, assign a keyboard shortcut and press OK. Next, go to your conversation window, type the chosen character sequence and hit Enter to send your new Custom Emoticon to your contact's screen. You know what? Back in January 2004 Microsoft filed a patent in the US for the just described procedure. It was published by the US patent office on Thursday. - Mark Taylor, executive director of the Open Source Consortium, said the patent could be particularly problematic as it covers basic human communication. "Emoticons are a form of language, and a precedent allowing patenting of language constructs is very dangerous indeed." - Jonas Maebe, a spokesman for the Foundation for a Free Information Infrastructure (FFII), said that "it is unfortunately quite clear such patents have nothing to do with protecting investments nor R&D, and only with obtaining exclusion rights which can help them [Microsoft] maintain their dominant position in the market." - Such patents are in contradiction to the original purpose of the patent system, according to Maebe's colleague at the FFII, Felipe Wersen: "Patents were ultimately designed to benefit society — to have companies disclose things that benefit society which they wouldn't otherwise disclose. Who does this patent benefit?" >> Read the full-length Custom Emoticons patent here. Happy 6th Birthday, MSN Messenger! To celebrate the software's 6th birthday, we've added the ultra-hip old-school MSN Messenger emoticons* to our free CustoMess content installer for MSN Messenger 7 and 7.5 BETA. They will bring back good memories to some, others (who've never seen them before) might fall in love with the simplicity of this 4-colored pixel art. Either way, don't let them disappear in oblivion and blow some new life into them! >> Download CustoMess in order to install the classic MSN Emoticons. >> More about the history of MSN Messenger in last year's post. - Now counting five options pages! - *HOT* Added "Switch Tabs To Right Side" option. - New Sign-in window DP removal option. - An option to remove the bottom links in the sign-in window. - Fixed "Hide Personal Messages" to work when viewing large DP thumbnails. - Now users are able to remove the "Messenger" title/caption. - Added "Remove Yellow Infobar" in contact list (as a response to the demands of removing the CEIP). - The "Add A Contact" button can now be moved to the dashboard/upper-panel. - Added "Remove Microsoft Passport Network" branding in Sign-in window. - Fixed "Remove Webcam Icon" button (now it squashes every hidden little webcam icon in each corner). - 8 new options for removing each button at the conversation window top bar. - A new option "Remove My Dynamic Backgrounds Menus". - Added "Remove Voice Clip" option. - Users can now select to remove Winamp support while restoring backups. Sidenotes: The Mess.be custom games menu will not work yet (not to be blamed on Mess Patch but on Microsoft for making some evil changes). Also, the Remove File Protections option and french & portugese translations are not included this time. Finally, a really big up to Rolando, TheBlasphemer and theunknown for developing the great product that is Mess Patch today. Also thanks to Juh, A. Madsen, jamesp0tter, Dhaya, Tarry, CokeFever, Ellkay, Yuppie, Braun and Koen for their translations and contributions. UPDATE: Because of several bugs, we temporarily removed support for the latest BETA build MSN Messenger 7.5.0162. Stay tuned for that version's Mess Patch. >> Download Mess Patch for MSN Messenger BETA 7.5.0160. The MSN subsidiary in The Netherlands is working on a paper magazine that will bear the name MSN Messenger Magazine. The first 50 000 copies of the new lifestyle mag will be published around the same time of the final release of MSN Messenger 7.5 (estimated: September 2005). The Netherlands is the first country worldwide to produce the magazine and other countries might follow their example depending on its success. MSN Messenger Magazine will offer a closer look at the MSN-community through realistic stories from boys and girls growing up in a world with Bluetooth, WiFi, Hotspots and Super-DSL. Exactly one year ago, a group of volunteers published an online magazine dedicated to MSN Messenger too, called msn:wh. Unfortunately, subsequent issues were held off. Two days after the first private MSN Messenger 7.5 BETA, Microsoft already issued a new build to its English testers numbered 0162. The only change is said to be a (visually) improved Audio and Video setup. Before you ask, the new build hasn't been leaked yet. 168pin and The Messenger just reported that the new BETA build has been leaked. 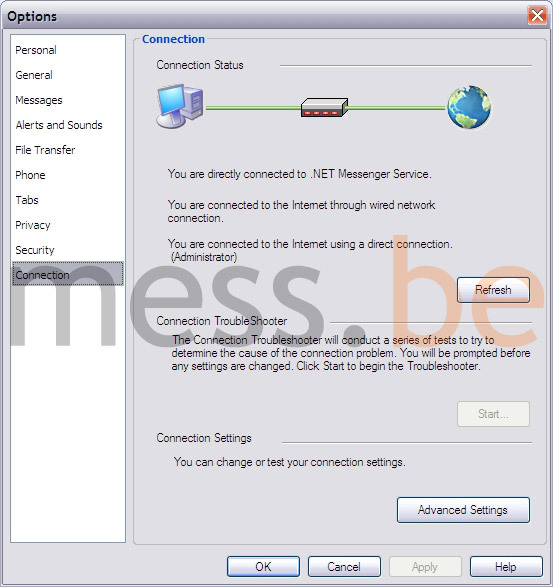 >> Mess.be forum discussion on MSN Messenger 7.5.0162. Personalize with background photos and news and weather information from MSN® or any RSS feeds from websites you choose. Search the Web and click news headlines directly from the Screen Saver. Stay connected with MSN Hotmail, MSN Messenger, and MSN Spaces. Track how many unread Hotmail messages and current Messenger conversations you have, and display blogs and photos from your friends' MSN Spaces. >> Download the MSN Screen Saver (Beta) here. Malware writers continue to pound users of Microsoft's MSN Messenger and AOL's Instant Messenger services with malicious messages containing links that could infect the victim's computer with a Trojan horse or dangerous worm. The latest threat is a Trojan called Kirvo which arrives in the form of an Instant Message from someone on the user's 'friends' list. The message contains a link to a Web site, which if clicked on, loads a copy of Kirvo on the computer. Kirvo is pre-programmed to then fetch a copy of Spybot, which is a dangerous worm that can take advantage of software vulnerabilities to spy on the user. Thought it was gooseberry season in the MSN Messenger universe? Think again, a new MSN Messenger BETA has been released to selected BETA-testers, including KebecoiS and sk8michael who were so kind to provide us with the first-ever screenshots of MSN Messenger 7.5.0160. The bug/feature/leak-hunting season has opened, y'all! First screens first, the sign in screen has been redesigned. If you tick the Remember Me option, it will show your MSN Display Picture and automatically fill in your e-mail address. There are separate options for saving your password as well, or sign in instanteneously altogether. Not much changes in the main window: the Add a Contact has been replaced at the top of the Contact List (rendering the bottom "I want to" actions pane obsolete) and the My Space button is now titled My MSN Space. Arriving in the conversation window, the Webcam and Audio buttons are now renamed to Video & Voice and the Video button also has a new symbol. A completely new feature we announced before are the Voice Clips, which enable you to send voice messages (or whatever you sample, really) by holding the button (or hold F2) and recording through your microphone. Yelling your contact's name sounds like a good alternative to the Nudge button. Obviously, this feature only works if both contacts own MSN Messenger 7.5. UPDATE: Voice clips can last up to 15 seconds, but their quality can be rather mediocre depending on the input. Luckily, they do not automatically playback when received and you need to press the Play button first. Bloat-alert: just like MSN Display Pictures, conversation window backgrounds can now be dynamic. While I have yet to see it in action, I can imagine many an epilepsy seizure caused by these Dynamic Backgrounds. I don't think anyone was waiting for this feature, but according to KebecoiS: "the animation is more pleasant [than Winks], the text color matches it so you can still see it clearly and it's not just annoying". Two Dynamic Backgrounds from Blue Mountain are included in this BETA. One has a fish swimming, the other shows world clocks (though according to Mini-Me the times shown on the clocks are not accurate, screenshot by sinuz). UPDATE: Want to see them in action? Here's a a video preview of Dynamic Backgrounds. As reported by SAM and balupton, free animated backgrounds can be downloaded here. Digging further, the Connection TroubleShooter is said to be more comprehensive. In the Security options you can now chose to disable hyperlinks in conversations (a protection against IM worms), disable Voice Clips and allow MSN Messenger to fire up a conversation window if you click a link in your web browser (the conversation link feature has likely been reinstated for use on MSN Spaces and Hotmail Kahuna). And in the Alerts and Sounds options, you can define a sound to be played when invited to an audio conversation. UPDATE: By default, it's two times a classic phone ring. Finally, some bad news for the pre-XP generation. According to XxRebelSeanxX on the forum, the MSN Messenger 7.5 setup only supports Windows XP. There's a small chance that this issue is limited to the BETA. UPDATE: The MSN Messenger 7.5 BETA-period will take place approximately six weeks during July and August. That's a final release in September, then? UPDATE 2: Several screenshots and facts have been added. Check the above post for the word UPDATE. Keep checking the news as we continuously update. - Messenger Plus!, CustoMess and IEDP 2 are all compatible with 7.5. The release of a Mess Patch for 7.5.0160 is still uncertain and depends on the demand is scheduled for tomorrow. - The Busy nudger bug is still present, as is the .pif group conversation kicker. - The chat area of the conversation window now comes with a slightly gradient background. - In the same conversation window, a tiny webcam icon underneath the Display Picture reveals whether the contact has installed a webcam (reported by Huuf). - When you apply a Dynamic Background the Nudge sound will change according to the background's theme (reported by SAM). Sometimes a Nudge is even accompanied by a Wink-sort-of animation. - Some Winks now have a maximum size and don't stretch out with the conversation window size (reported by Fr@nKy. - Just like we did during the MSN Messenger 7 BETA, we're compiling a list of MSN Messenger 7.5 bugs. If you have any other news or revealing screenies, share them with us! According to an article published by SecurityFocus on Saturday, MSN Messenger and Internet Explorer contain a security vulnerability in the way they process ICC Profiles embedded in images. When their header data is tampered with an attacker could crash both Microsoft software titles and possibly even execute malicious code on the victim's computer. "The condition is likely due to an integer handling error. The author has stated that the crash observed was due to an access violation on a memory read attempt, possibly due to an out-of-bounds array access." Both MSN Messenger 6 and 7 are vulnerable to the exploit, as well as most versions of Internet Explorer (check the list). We expect Microsoft to issue a security fix soon in order to solve the problem. In February, the company released a critical update to MSN Messenger only days after another image vulnerability was published on the web. Keep your eyes on this space! Harry Potter Harry Potter Harry Potter Harry Potter... satisfied? A Messer called ka_orca contacted me telling I was discriminating Harry Potter fans worldwide because I didn't pay any attention to this weekend's release of J.K. Rowling's sixth book: Harry Potter And The Half-Blood Prince. "By far, people prefer HP over Charlie and the Chocolat Factory...", the e-mail read. Ok, there's a point in that. As a die-hard Oompa Loompa fan, I do feel lonely sometimes. So here's a post chock full of witchcraft and wizardry! >> Browse Harry Potter Display Pics. >> Browse Harry Potter Emoticons. >> Harry Potter Nicknames (for male Messers). >> Harry Potter Names (for female Messers). I'd also like to invite all Harry Potter fans (*very explicit look at ka_orca*) to contribute to our HP MSN Display Pictures and emoticons collection. Cooling down from a wild weekend I return to you this Sunday evening with a new MSN Messenger skin building further on the popular Wave 11 skin, which was already installed by ten thousands of Messers. Wave11: Glass is the latest effort from Fizical and theunknown who will from now on publish their skinning work as The Messenger Lab (new website soon at messengerlab.com). This skin too comes with lots of color choices and on-the-fly patch options like polygamy and custom games. Get it now, because Messers on the forum are already raving about it! >> Download Wave 11: Glass.